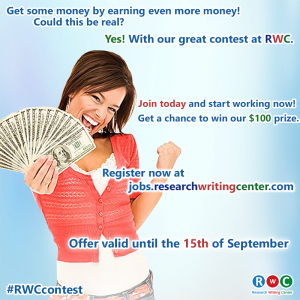 Contests And Promotions From Researchwritingcenter.com | Want to Be a Freelancer? Join People Doing the Job They Like! Contests and Promotions from ResearchWritingCenter.com	 We Have a Winner! Our Contest for a Chance to Win the $100 Cash Prize is Over. Editor’s note: as it came to our attention – some of the writers were not satisfied by the results. Particularly, writer ID 30685 pointed out that he has completed more than a hundred pages, so the results of the contest must be wrong. We had to recheck the results just to make sure and it turned out that a bug in the system prevented us from properly counting the number of pages completed. This bug has been eliminated and we are editing the results below to reflect the real winner. That’s it. The month blew past us in what seemed to be just a moment. Our writing contest is over. If you don’t know what contest we’re talking about – check out this post on our blog. Anyone who completed an order within the given time frame was automatically enrolled into the contest. All of the completed orders done from the 15th of August up until the 15th of September went towards the contest. The main criteria for the contest was the number of completed pages. The $100 prize will be transferred to the winner’s account with RWC and paid during the next payment period. 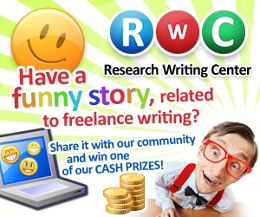 Contests and Promotions from ResearchWritingCenter.com	 Get a Chance to Win a $100 Cash Prize from RWC. Requirements? Just Work! On August 15th we’re launching a new contest at ResearchWritingCenter.com. We’re doing this to bring the community together and get everyone warmed up for the high season that’s closing really fast. All you have to do is write. If you’re not a registered user – simply apply to join our community here! Finally, guys! We get to highlight the winner of our writing contest. This submission won our hearts, especially because we know that it’s a true story, which makes it even more humorous. Check out the previous submissions for our “Start Writing & Get Us Laughing” contest. The point of the contest was pretty simple – write an amusing story about freelance writing (fictional or from your own experience). Contests and Promotions from ResearchWritingCenter.com	 Start Writing and Get Us Laughing Contest Submission: I Did It for the Story! This week we are presenting you the 2nd place winner in our “Start Writing and Get Us Laughing” contest! We’ve identified 5 winners of the contest and wanted to highlight these contest submissions for you. Make sure check back next week – the winning submission will be waiting for you! “I Did It for the Story” by Shad W.
In this article we’re going to highlight the 3rd place winner of our “Start Writing and Get Us Laughing” contest, which ended recently. Make sure check back next week – another submission will be waiting for you!